Home Staging from Barcelona with worldwide reach. Markham Stagers Home Staging projects are present in publications on Homify and Houzz, the two most professional global web platforms in the home and interior business. 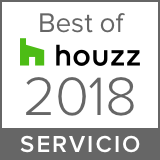 Houzz is the best known and most established web platform on architecture and interior design in the world. It was created in 2010 and is based in Palo Alto, California. Since May 2015 it also has a presence in Spain. The best architects, interior designers, decorators and professional in the business display their work in Houzz. Its Editorial section is one of the most interactive between users and professionals with diverse themes within the home industry. Markham Stagers collaborates with Houzz, writing its Editorial section as Experts in Home Staging in Spain. Houzz also has an app for IOS and Android. Since 2013 Homify has been the European counterpart to Houzz and is based in Berlin. It is currently present in 21 countries in every continent. Their editorials publish numerous articles of interest for all its users and Markham Stagers has been participating on numerous occasions since the creation of its profile in the summer of 2015. The profiles in Homify’s social media presence has thousands of followers spanning the entire globe. [NL] Vinyl op de vloer; het kan weer! [IT] 10 ragioni per scegliere un mobile bagno con lavabo doppio ! [MX] ¡7 tips para hacer más grande tu casa! [MX] Baños con madera – ¡10 ideas fantásticas! [PT] Tapetes para a sua sala de jantar e sala de estar! [MX] Cocinas: ¡10 pisos e ideas sensacionales! [BR] Armários perfeitos para banheiros!